Namaste, everyone. 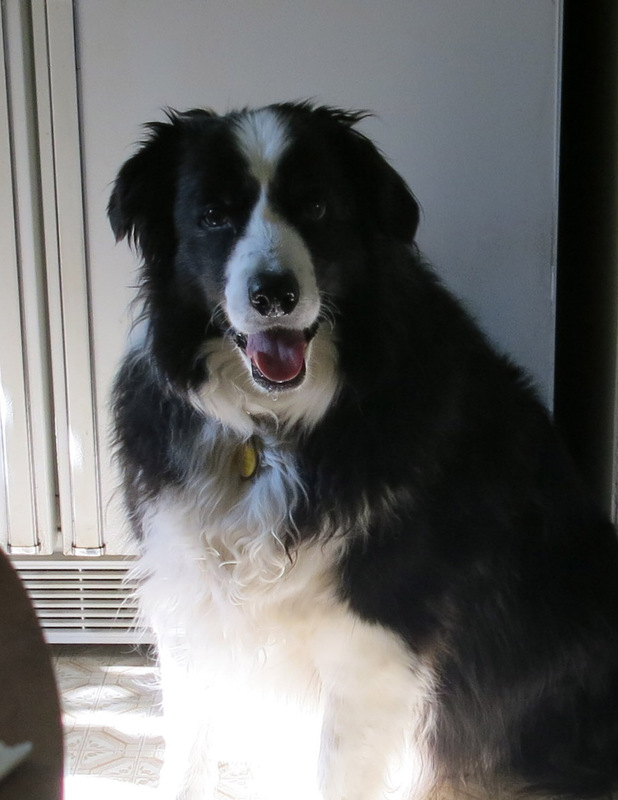 It is I, Chess the border collie, here to provide you with the standard of excellence you have come to expect. You may remember me from such totally excellent posts as “Windy and Warm”, and “Going to California”. Here I am, staring at the guy I live with, expecting him to notice me and give me a biscuit for being so delightful. To the west, the skies have become dark, and I’m pretty sure I hear thunder. The guy I live with promised to cuddle me and give me Rescue Remedy if it gets really scary. He made a biryani the other day, and the sauce was ghee, tomato sauce, and fenugreek leaves; he used frozen fresh fenugreek leaves and he’s been smelling like fenugreek ever since. Not that that’s a bad smell, but my mommy did forbid the toasting of fenugreek seeds in the house. The smell, or as he would say, the aroma, would hang around for days. My mommy liked Indian food and made the guy I live with cook it for her all the time. She practically tied him to the kitchen stove. And then after a week of all these healthy vegetables she would tap him on the arm with her fingers, the way she did, and say “Take me out for a hamburger”, which of course he would do. I never got to go out for a hamburger except for one time. 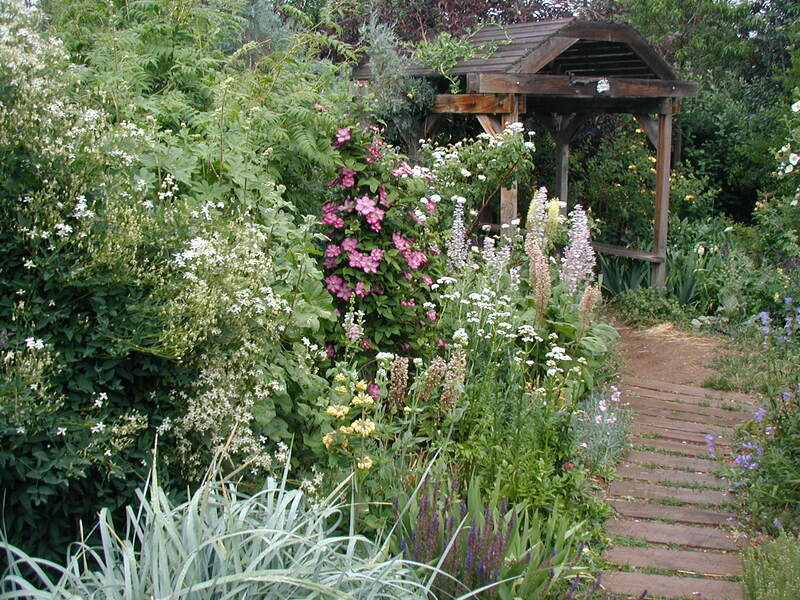 What I really wanted to talk about this time are the changes that have been made in the garden since I was little. 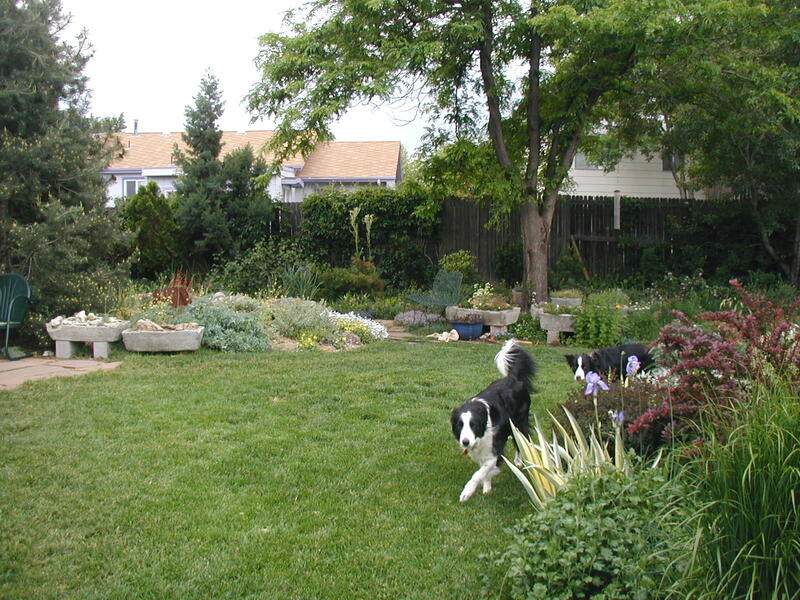 My mommy took all these pictures of the garden, except the last two. Here’s one taken right after I showed up, with my new buddy Slipper. 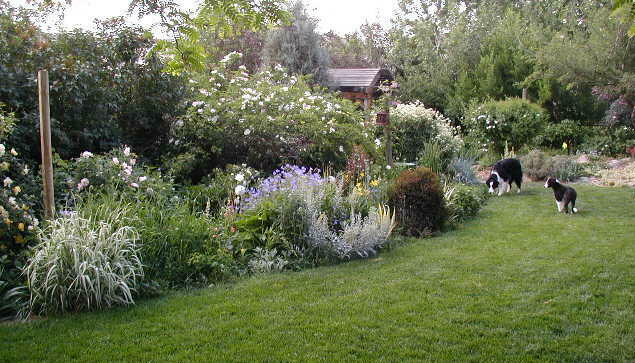 Look at the “Long Border” and the lawn. How utterly English, huh. 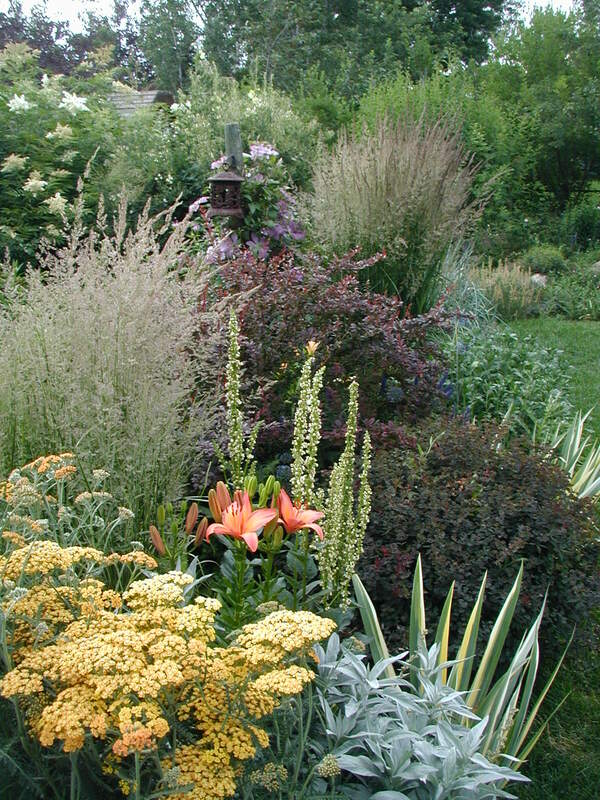 My mommy didn’t take many garden pictures because she said too much green gave no sense of depth, and so the guy I live with replanted the Long Border with plants of different foliage color and, voilà, instant depth. And look at little me, too. I was extra cute. Here’s my grampa Flurry hoping I haven’t noticed him, but of course I have. He didn’t like me very much, but I liked him. He was old and creaky and grouchy when I met him. Here we all are. The guy I live with says these were taken in 2002. Me in the middle here. I’m not in this. I could be somewhere in the garden, but I’m not here. That must account for the lack of interest in this picture. This was taken in 2001 but that’s close enough. I’m not in the picture either. The guy I live with says I wasn’t born yet. My grampa Flurry died early the next year, that is, in 2003; he was 17. 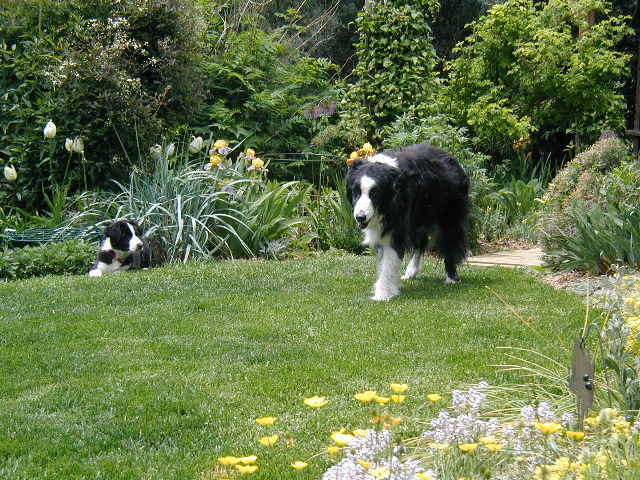 This is my buddy Slipper when he was four, with me behind him, when I was two. 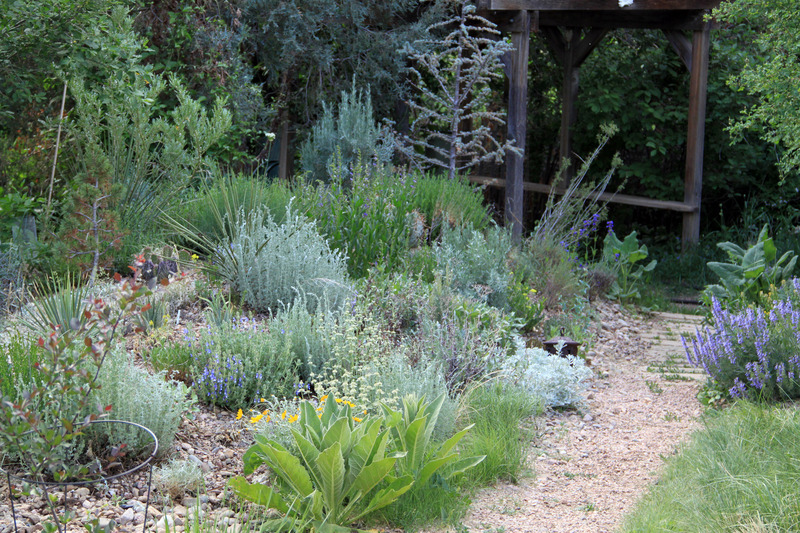 Well, this was the Long Border. The guy I live with got tired of having to water it, and smooth brome snuck into the garden and was impossible to get rid of, the way it is. Then my mommy died, and the guy I live with just stared at the Long Border all summer and autumn, and then voles invaded the north third of the border, and ate everything. They even destroyed the Clematis recta ‘Purpurea’ which you can see in the picture above, just to the right of the Chinese lantern hanging on the pole. The voles ate the whole plant, and pulled out the enormous root and left it lying on the ground. The guy I live with took this as a sign. He doesn’t believe in signs, but he took this as one. He dug up all the plants and put in new ones, plants that didn’t need constant watering, weren’t attacked by bugs, and stuff like that. The clematis got blister beetles something fierce, and the whole thing was defoliated in days, as was Clematis heracleifolia and ‘Mrs. Robert Brydon’. If you’ve been paying attention you’ll know that the guy I live with isn’t a big fan of bugs, and blister beetles are not fun at all. My mommy got blisters from one once, and she used to do in the beetles with Dr. Bronner’s. This is what he did. He’s leaving the mulleins there because he says they’re not the regular weedy one. There’s the Chinese lantern, too; just sitting there because the guy I live with is waiting for the sign he doesn’t believe in to show him exactly where it should go. I say, probably not sitting on the ground. It’s a series of raised beds now, partly because the guy I live with had a bunch of old concrete and some tires he needed to get rid of, and a collection of bound National Geographic going back to 1906 that had been sitting down in the crawl space. My mommy used to say how much they creeped her out, being down there. When it was mostly finished people would look at it and tell the guy I live with how much they liked it before. No one ever said anything before, so he wondered about that. It reminded him of the story told about Rossini, when a young composer brought him the scores of two operas he’d written, and Rossini looked at the first one and said, “I like the other one better.” But now the garden isn’t as photogenic because there aren’t plants with different colored leaves. I, however, am extremely photogenic, but am not in these pictures for some unfathomable reason. So that’s how things changed. The guy I live with says nothing is permanent, which is easy for him to say because he rips out plants left and right. The Long Border is gone, the green lawn is gone, the pool is gone, but there are new things here. I guess that’s exciting. I hope, at least, you enjoyed all the pictures of me. Until next time, then. 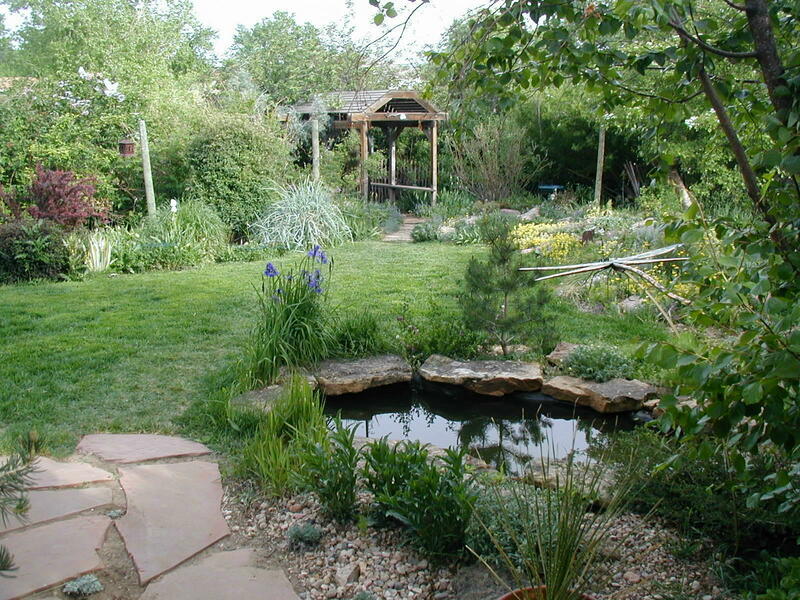 If it weren’t for the arbor in the back, I would say it was a completely different garden, which, actually, it is. I’m actually heartened that once you had a hectic lawn. I’m officially classifying my lawn as a phase. Gardeners have to have phases. And a bit of amnesia when it comes to the price tags of now-gone plants. 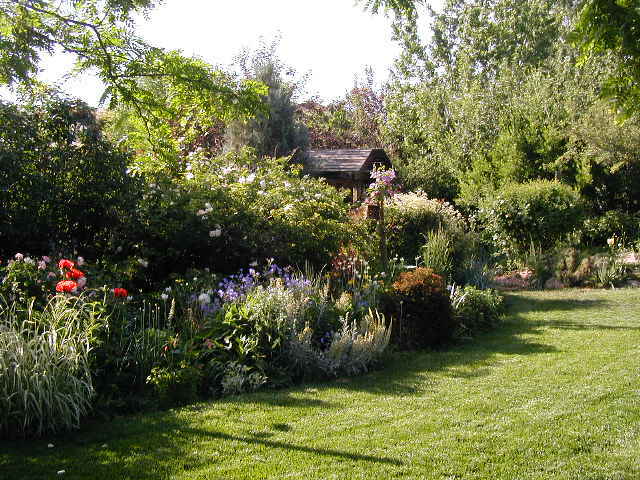 The lawn pictured was the “Great Lawn”. 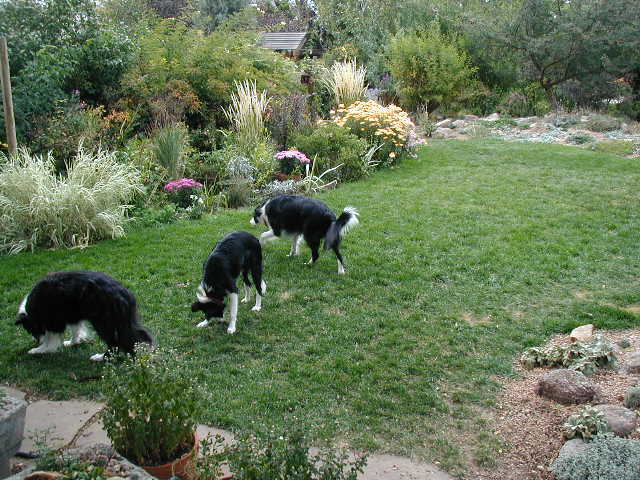 It was originally weedy bluegrass, then it was blue grama from seed with border collies running over it, then it was 609 buffalograss, 90 percent of which died winter 1999-2000, then it was replaced with strips of bluegrass sod, then it was seeded “Colorado’s Own” (ryegrass, fescue, and bluegrass), and now it’s come to this. 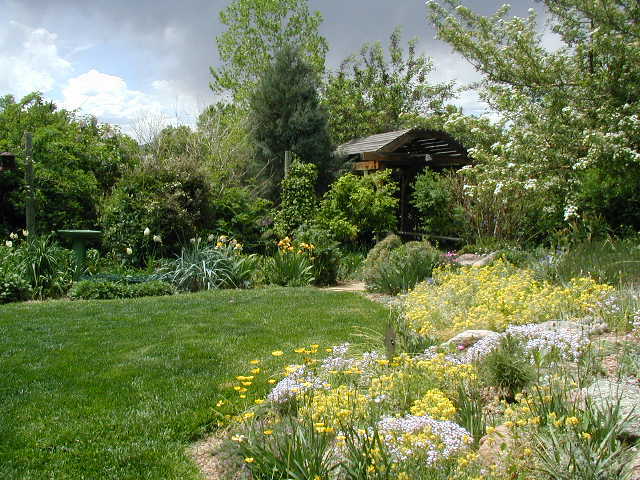 The “way back” lawn was pictured in “Serious Talk About Lawns”, and that’s “Colorado’s Own”, after a turf-type fescue lawn died after the drought of ’02. 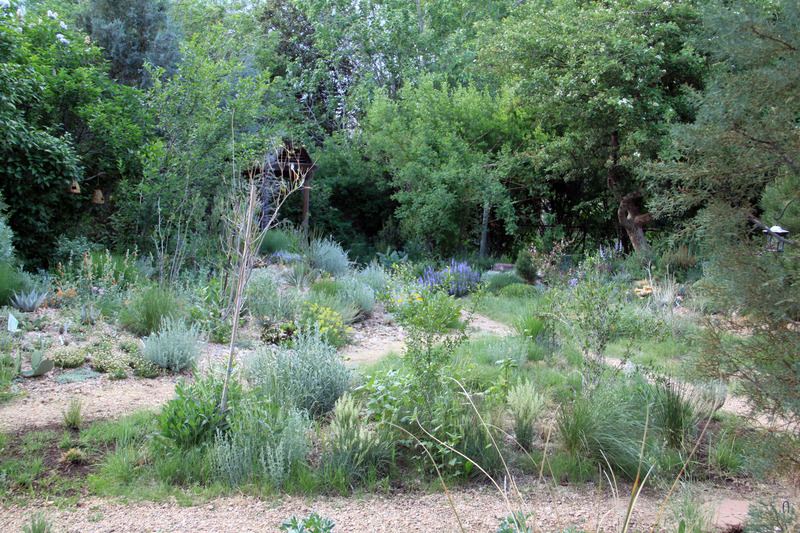 A lot of people like the “way back” better than the rest of the garden; until I get finished with it, anyway. Thanks for the look back Chess! If you mean the dog, he would agree. …. 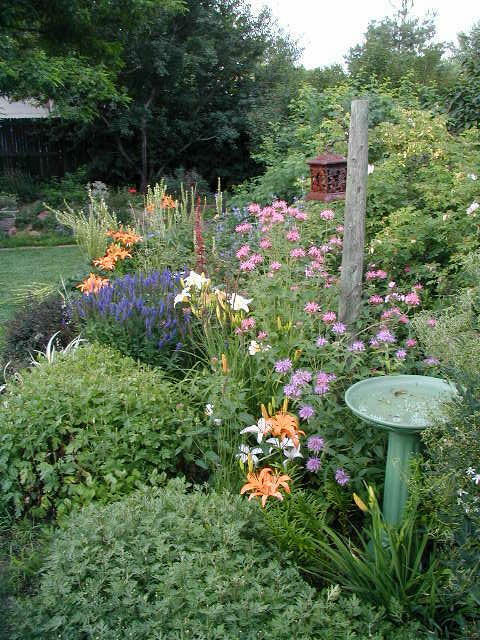 The Long Border looked pretty good sometimes, but it was a point of contention between us, because Cindy didn’t want to weed out the grass invading the garden on several fronts, and I didn’t want to spray all the clematis for blister beetles. 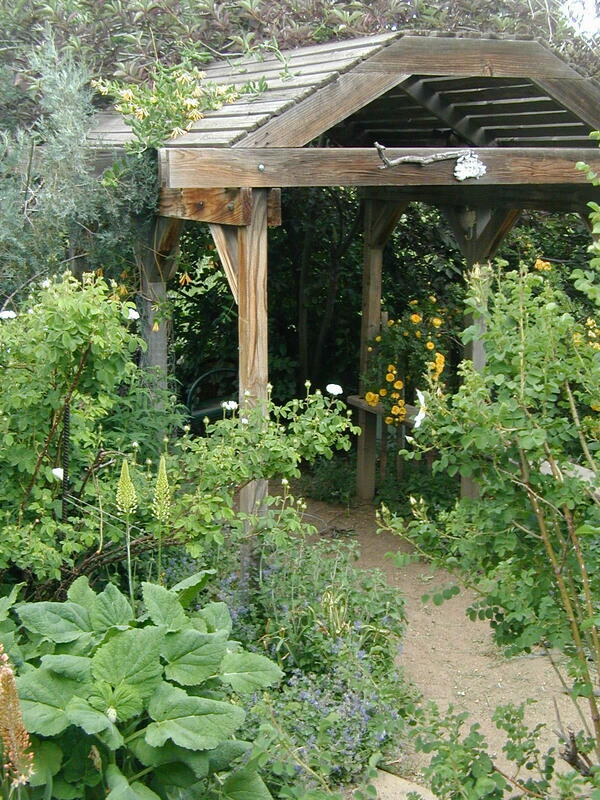 The Clematis recta Purpurea would get huge and then blown over by wind, so it had a structure of rebar ….and it still fell over. The soil was terrible and getting the grass out was a nightmare. So I didn’t feel too bad when I dug out everything. Makes sense. We were weeding a garden today that I would rather just do over!! It’s unbelievable how fast the weeds you just pulled out grow back, isn’t it? Sigh. Gosh, I didn’t know we had native blistering beetles. I once had “extract of blistering beetle” applied to a plantar’s wart on the sole of my foot. It stung but did the trick. 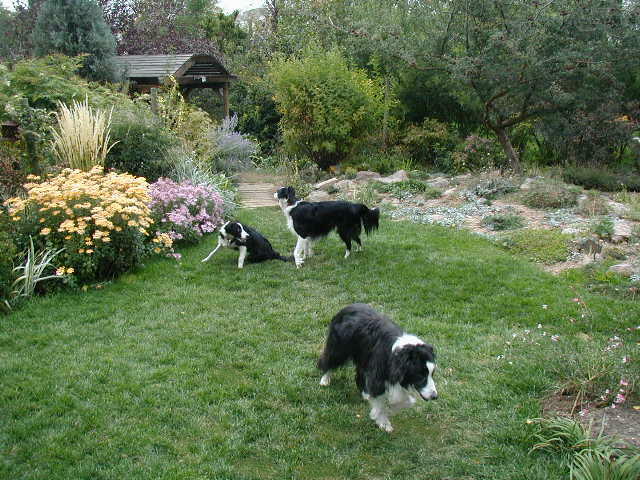 –Great pix of the collie pack! Slipper looks much taller than his compatriots. Gray and black blister beetles. Same family as the one that provides Spanish Fly, I think. Slipper was big. Very long legs. He was a little more aloof than Chess, his cousin, but he adored Chess, though Chess was really pushy when it came to getting tickles and stuff. What a great look at the way things change. My gardens are always being reinvented. Something only other gardeners understand. Love the pix of all the pack, Chess must have had a fun puppy hood with all those pooches…. Thanks for keeping the posts coming Chess! Yes, well, look what he did today …. My buddy Slipper used to grab my grampa Flurry by the tail and drag him around. Then when I showed up, my buddy Slipper started playing with me instead. I was funner.